I Want You To Want Me is an interactive installation about online dating, commissioned by and installed at New York's MoMA on Valentine's Day 2008, as part of their Design and the Elastic Mind show. 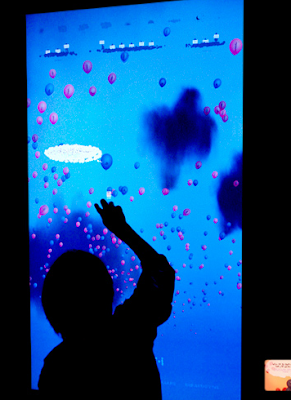 Displayed on a 56” touch screen monitor, the piece portrays an interactive sky filled with hundreds of pink (female) and blue (male) balloons, each representing a real person’s online dating profile collected from any one of several dozen Internet dating websites. Viewers can touch individual balloons to reveal personal information about the dater inside, and can rearrange the balloons in various ways to highlight different aspects of the world of online dating, including the top turn-ons, the most popular first dates, and the top desires. It is a collaboration with Sep Kamvar. astonishing. have e harmony seen this yet?